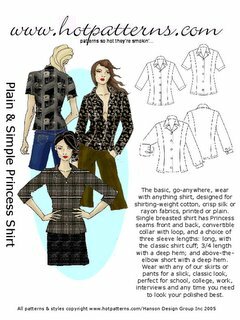 This is my version of the Hot Patterns "Plain And Simple Princess Shirt", fashioned from buttery soft Ultra Suede. This garment is interfaced with Pro-Weft Fusible Interfacing. While this shirt has basic princess style lines, the pattern is drafted in a sophisticated manner. Rather than the usual Convertible Collar/facing combo that is "supposed" to look like a lapel...this pattern is drafted with a classic tailored collar and lapel. 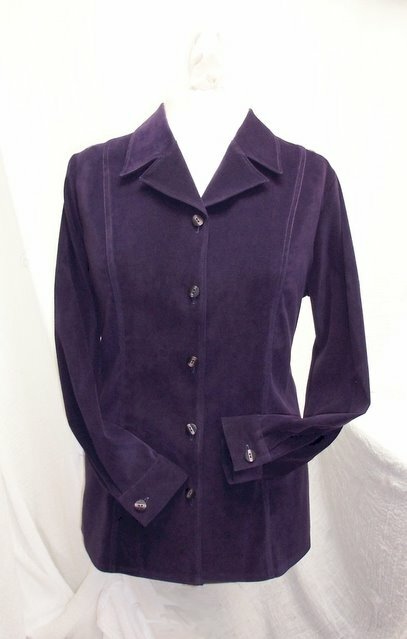 This makes for a very smooth flat revers and a collar/lapel that rolls into perfect position and stays there! I have made this style many times, in fabrics from denim, to silk, to the eggplant Ultra Suede pictured here. I highly recommend this pattern, and will continue to use it myself again and again because of the many style variations that are possible. Piped seams, slot seams, felled seams, bias cut, and contrasting color collar/lapels all represent interesting design opportunities!